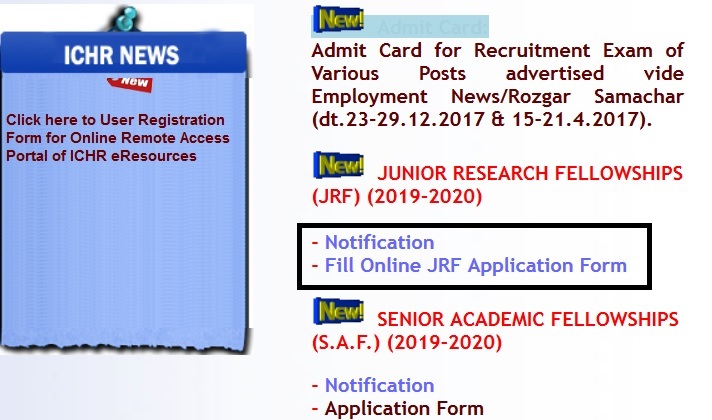 Applications are invited from the eligible candidates for the JRF of ICHR for the academic year 2019-20. Candidates who have registered in recognized Universities for Ph.D. programme in Historical Studies are eligible to apply for the Fellowship (JRF). Just follow the below steps to apply for the ICHR JRF 2019-20. Step 2 : Hard copy of the application generated after filling of online application [with auto generated number] duly signed and along with the requisite documents should be submitted. Step 4 : An application fee of Rs. 500/- (Rupees five hundred only) shall be paid in the form of a Demand Draft drawn in favour of the DDO, ICHR, [payable at Delhi]. (candidates belonging to SC/ST/Persons with Disability (PWD) category are exempted from payment of the fee). Submission of application both online and printout of the same along with computer generated unique ID number is mandatory. Hard copies of applications without unique Id. Number will not be accepted. 1. Self attested copies of certificates of educational qualification. 3. Self attested copies of language qualification certificates, if applicable. 4. Self attested copy of category certificate (SC/ST/Physically Challenged), if applicable. 5. Self attested copy of Ph.D. registration certificate. 6. Self attested copy of Research Proposal. 8. Self attested certificate of Supervisor/Head of Department regarding the suitability of the candidate for the award of fellowship. The examination will be conducted in 02 Stages. a) Stage I examination will consist of 100 online Objective type questions. Each question will carry 01 mark (Total 100 marks). b) There will be no negative marking. c) The candidate has to choose his/her area of specialisation (Ancient/ Medieval/ Modern India) at the time of filling online JRF application form. All the questions in the question paper will be based on the area of specialisation opted by the candidate in the application form. a) The candidates shortlisted on the basis of merit of Stage I examination will be called for the Presentation and Interview. b) Each shortlisted candidate will make a Presentation based on his/her registered PhD research topic (8-10 minutes, preferably PowerPoint) followed by an interview. c) Presentation and Interview will carry a maximum of 60 marks. d) All shortlisted candidates should bring their Hall Tickets issued for Stage I entrance exam while coming for the Presentation and Interview. b) The Stage II (Presentation and Interview) will be conducted at the ICHR, Headquarters, Delhi only. The selected fellows will be awarded fellowship of Rs. 17600/- (Rupees seventeen thousand and six hundred only) per month plus contingency grant of Rs. 16500/- (Rupees sixteen thousand and five hundred only) per annum for a period of Two years.